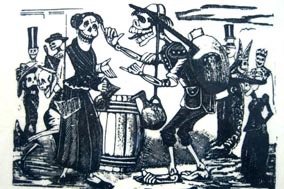 Skulls take Casa de las Américas | Cuba Headlines – Cuba News, Breaking News, Articles and Daily Information In salute to the Bicentennial of Mexican Independence, Casa de las Americas exhibits at the Latin American Gallery the collection of prints of engraver José Guadalupe Posada. "> In salute to the Bicentennial of Mexican Independence, Casa de las Americas exhibits at the Latin American Gallery the collection of prints of engraver José Guadalupe Posada. In salute to the Bicentennial of Mexican Independence, Casa de las Americas exhibits at the Latin American Gallery the collection of prints of engraver José Guadalupe Posada. Among his most significant works, some of his famous skulls.